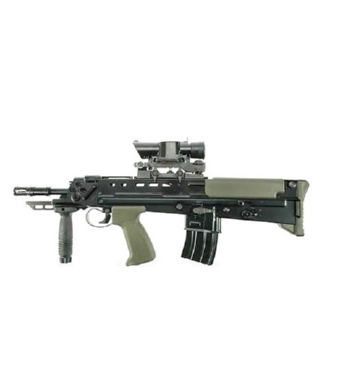 PRODOTTO DALLA ARES, FUCILE ELETTRICO MODELLO L85 AFV FULL METAL. CARICATORE 150BB (COMPATIBILE M16 - M4), PALLINO 6mm (CONSIGLIATI 0,20/0,23/0,25), MODALITÀ D'AZIONE A COLPO SINGOLO E RAFFICA. UTILIZZA BATTERIE LARGE/MINI TYPE (NON COMPRESE), VIENE FORNITO SENZA CARICA BATTERIA. GUSCIO IN METALLO, NEL FRONTALE VERTICAL GRIP RAIL SYSTEM IN ALLUMINIO, IN DOTAZIONE OTTICA SUSAT 4X.